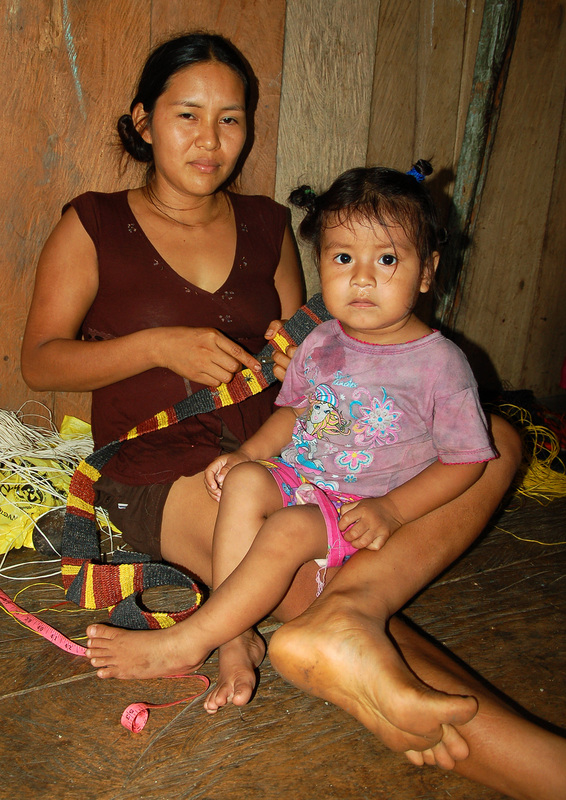 One of the best parts of this work is getting to know people who live in small Amazon communities. They welcome us into their homes, feed us, let us play with their children, and photograph their daily lives to help others appreciate their culture and challenges. The toughest part is realizing that some mothers and daughters who have sold us crafts succumb to the harsher conditions in these beautiful remote places. Two summers ago I was shocked to learn that Alida Soria, a young Bora artisan from Brillo Nuevo, died along with her husband and young daughter when a tree fell during a sudden storm when they were camped by a river. 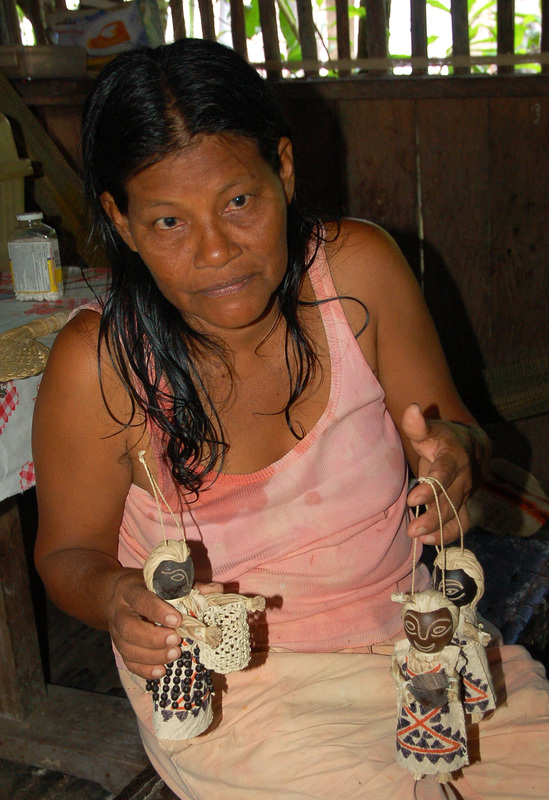 I just learned that Carlina Davila, a Huitoto artisan from Puca Urquillo who was the mother of seven children recently died from uterine cancer – an affliction that has taken six other women in the area in the recent years. Girls who are 15 years and under are now being vaccinated against HPV, but older women in the region are still quite vulnerable to these afflictions. These incidents strengthen my resolve to help improve the economic and health conditions in this region. The Center for Amazon Community Ecology has been studying the relationships between copal resin and insects at the Jenaro Herrera field station on the Ucayali River in Peru since 2006 to help develop sustainable methods to harvest this resin to make fragrant essential oil. While most of this research has focused on the weevils that form resin lumps on select trees, another fascinating part of this work is studying the bees that collect this and other plant resins to make their nests. Most are stingless bees, but they can still aggressively defend their nests against intruders. 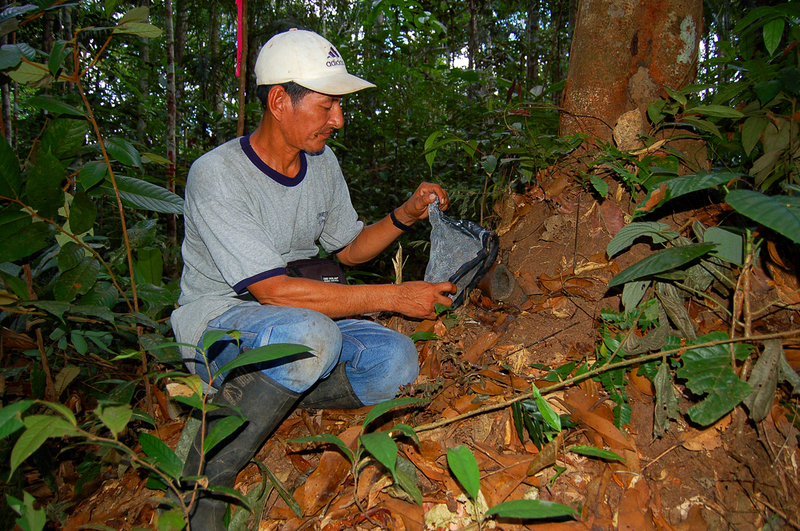 Our field team spends one day a month observing the bees that harvest copal. We also look for their nests to get a sense of how far they travel to collect this resource. We’ve found a wonderful diversity of bee nests in the forest – some from species that collect copal and others that don’t. So far we’ve seen a giant nest surrounding a tree, an entrance tube to a nest inside a hollow tree, a well-guarded dome-like entrance to an underground nest, and black and white oval entrances to bee nests inside termite nests. See more about our study and check out David Roubik’s classic book Ecology and Natural History of Tropical Bees to learn more about this intriguing topic. 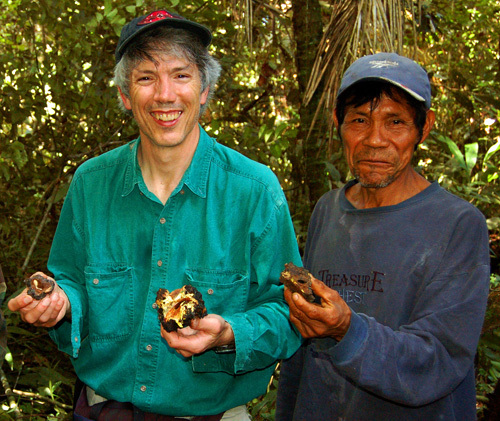 CACE founder Campbell Plowden’s first-hand account about working with native communities to develop essential oils from the resin and leaves of aromatic trees in the Peruvian Amazon was the most popular fieldwork interview published by UK naturalist James Borrell on his blog. His piece describes the location, highlights, challenges, and target species in CACE projects, and tips for doing research in the biologically and socially complex environment around traditional communities in the Amazon. 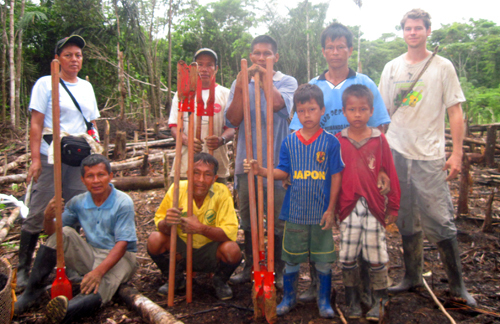 See Fieldwork: Rainforest Communities. Check out all 20 fieldwork stories by other ecologists working around the world and vote for your favorite. 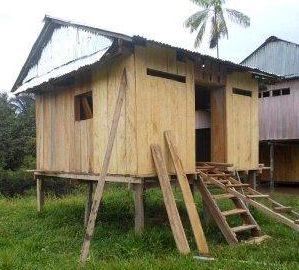 The Center for Amazon Community Ecology and its ally NGO Camino Verde have carried out the first phase of a reforestation and essential oil production project in the Ampiyacu region. 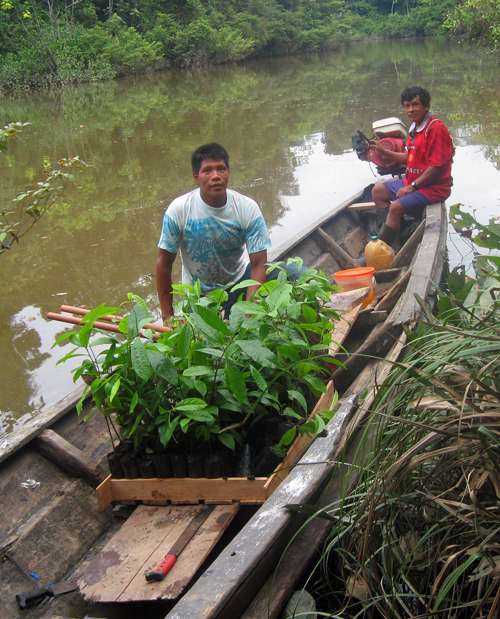 In early February, we had 900 young rosewood trees (Aniba roseaodora) ready to deliver to their new home down river. CACE’s field assistant Italo Melendez accompanied the seedlings on their journey from the government nursery in Jenaro Herrera by truck to the port where they were transferred to a ferry boat to go down the Ucayali River to Iquitos and then completed their journey by speed boat to Brillo Nuevo. The young rosewoods were divvied up by the five families who had won a chance in a village lottery to plant one of the first batches of these aromatic trees. 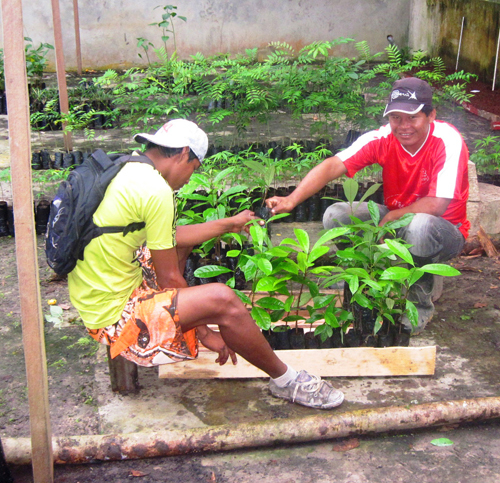 Each family then brought its crates of seedlings to a patch of secondary forest to plant with guidance from Camino Verde’s director Robin van Loon. Ampiyacu project manager Yully Rojas reported that most of the seedlings were growing well in early April although a few had been chewed by hungry grasshoppers and others had been lifted by jealous neighbors. We are now exploring larger distillation units to extract oil from a modest harvest of leaves in several years. 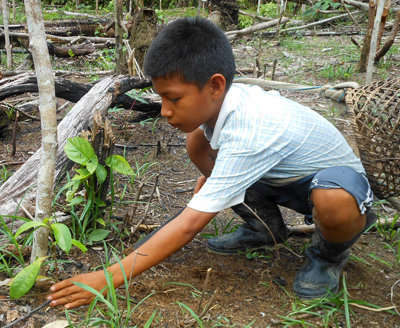 See more photos of the Rosewood seedling journey and reforestation in Brillo Nuevo. 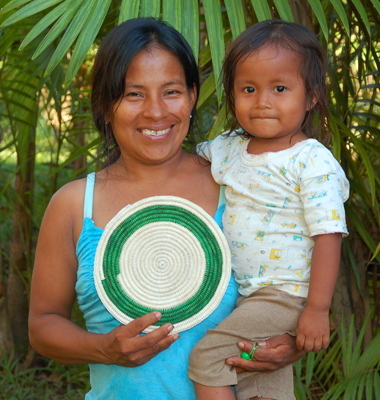 One way the Center for Amazon Community Ecology creates sustainable livelihoods and promotes forest conservation is helping native artisans to develop and market innovative handicrafts. 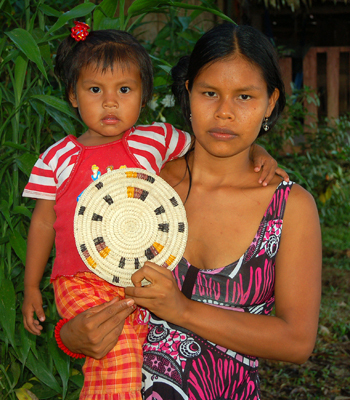 Our Bora and Huitoto artisan partners from the native villages of Brillo Nuevo and Puca Urquillo along the Ampiyacu River in Peru have woven six beautiful designs of hot pads with chambira palm fiber that we are offering to people who support the CACE Ampiyacu Project in Peru on GlobalGiving through May. 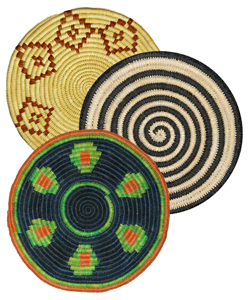 A decorative hot pad would be a great gift for any mother here that would help a native mom and her community in the Amazon. 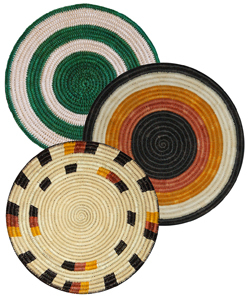 See more photos of artisans with hot pads. CACE is pleased to welcome Audrey Maretzki to its Board of Directors. 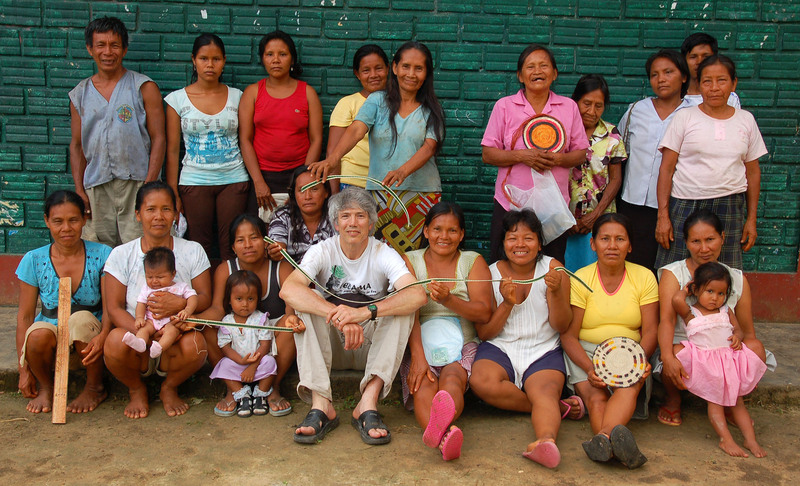 Dr. Maretzki is a Professor Emerita of Food Science and Nutrition at Penn State University and co-director of the Interinstitutional Consortium for Indigenous Knowledge. 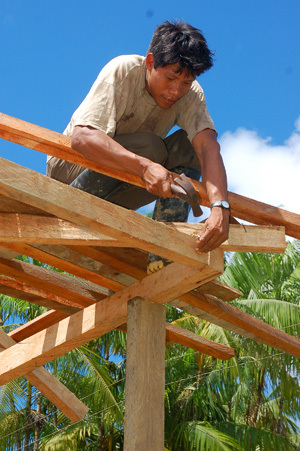 ICIK is part of a global network of 20 indigenous knowledge resource centers. 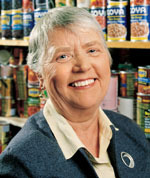 Dr. Maretzki was a board member of the Marjorie Grant Whiting Center through 2012. 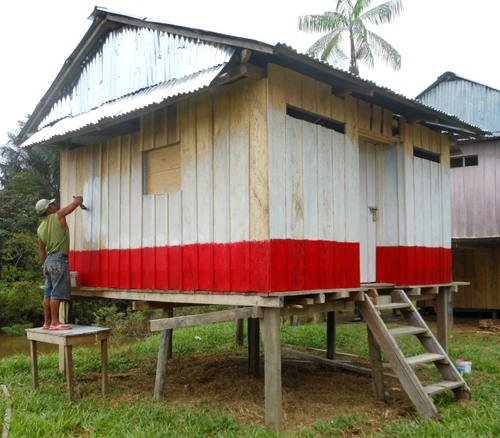 This foundation supported social, cultural and environmental projects throughout the world including our Ampiyacu Project in Peru. Audrey and MGWC also introduced us to Robin van Loon (CACE’s most recent Advisory Board member) and his group Camino Verde and supported our joint efforts to launch a rosewood reforestation and essential oil project in the Bora native village of Brillo Nuevo and develop other non-timber forest products in northern and southern Peru. Audrey spent much of her twenty years at Penn State helping to lead two food production initiatives in Kenya and Namibia. These programs enabled rural women farmers to develop and market nutritious, culturally-appropriate, and stable food products using locally produced commodities. Earlier in her career she worked on other nutrition and health related research and projects at the University of Hawaii and the US Dept. of Agriculture. See Dr. Maretzki’s biographical profile. CACE welcomes Audrey as a Director who has already demonstrated her support for our mission and appreciate her willingness to share her deep experience as a non-profit board member, grant writer, and advocate for people and conservation.